Now that both Google and Amazon have released their fourth quarter results for 2017, it is becoming abundantly clear that investors favor Amazon’s growth over Google’s massive profitability. In fact, according to recent reports, Alphabet, Inc. – Google’s parent company – saw shares a drop by 5-percent following the report’s release compared to Amazon’s gain of 3-percent. Google’s dropping percentage effectively cancels out gains for the full year. That doesn’t necessarily come down to profitability, either. Google saw its operating profits shoot up to $26.1 billion last year. Instead, it appears to come down to growth. While the search giant’s advertising revenues saw a jump of 20-percent for the year, it’s traffic acquisitions cost outpaced that by 9-percent. Meanwhile, Amazon’s annual revenue growth also outpaces Alphabet’s by around seven percent – falling in at 28-percent as compared to 21-percent, respectively. 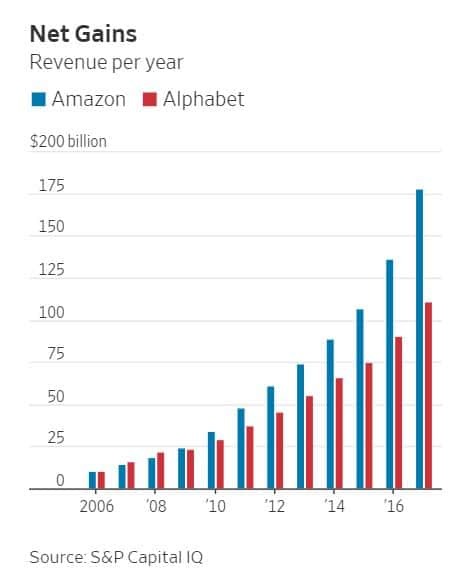 As shown in the chart below, Amazon’s growth has outperformed Google’s for the past seven years. It’s not all bad news for Google, however, as it remains the leader in terms of advertising revenues and holds onto its enormous lead in some markets – owing to its increasingly popular Android OS and holding 31-percent of the smart home assistant market. In combination with its widely used cloud platform, Google actually stands to come out far ahead of Amazon – whose own profits come nowhere near to what the search giant pulls in. Moreover, according to Alphabet’s chief financial officer, Ruth Porat, the company fully expects growth of its acquisitions costs to begin to be addressed toward the earlier parts of this year. 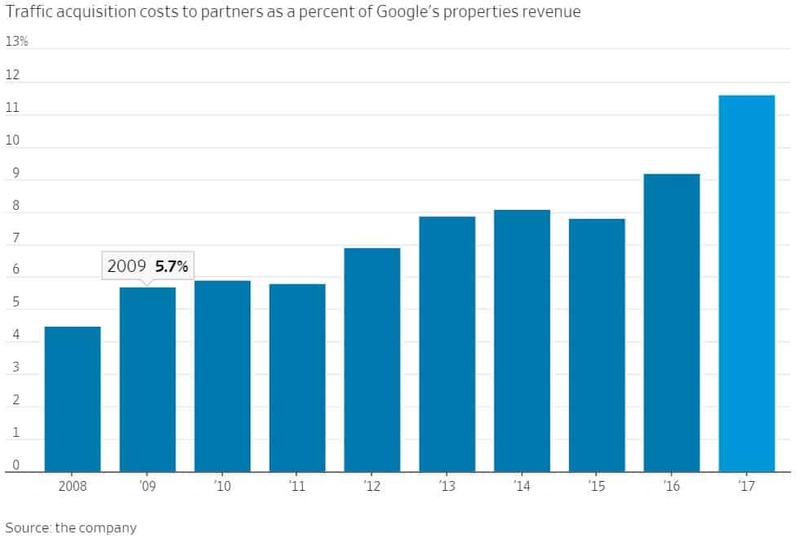 It those costs can be brought under control, generating a larger growth margin, there’s no reason Google can’t come out on top with investors since its profits in a single year actually outperform Amazon’s lifetime revenues. With that said, there’s no guarantee that Google can catch up to Amazon’s Alexa platform either – which is arguably a key area where Google is struggling to catch up. While Google’s own digital Assistant platform is arguably a more natural experience to use, Alexa has a far greater integration with smart home products. Given that this is the year when smart home appears ready to really explode in the consumer market, Google is going to need to spend a great deal more to really catch up on that front. At the same time, Amazon’s platform has been rapidly improving as well. So that’s one area where the latter company has a definitive upper hand and it may not be possible for Google to simultaneously gain market share and improve its figures, at least for now. You are reading an article on the Amazon’s Growth Outpaces Alphabet, Leads To Shift In Market. All materials on the site Gadgets F, а также и статья Amazon’s Growth Outpaces Alphabet, Leads To Shift In Market - written for the purpose of information enrichment and we are happy if you like our magazine.